반달가슴곰은 동부 시베리아, 중국, 캄보디아, 태국과 히말라야, 대만, 일본과 우리나라의 백두산 부근, 설악산, 지리산 등지에 분포한다. 몸길이 1.92m, 꼬리길이 80㎝, 몸무게 107㎏정도이며, 몸 전체가 광택이 나는 검은색이다. 앞가슴에는 반달모양의 흰 무늬가 있는데, 이 무늬는 변화가 심하여 큰 것도 있고 작은 것도 있으며, 드물지만 전혀 없는 것도 있다. 코는 뾰족하고 짧으며, 이마는 넓고, 귀는 비교적 크다. 잡식성으로 여러 종류의 머루·산딸기·다래·도토리를 즐겨 먹는다. 봄에는 나무의 어린 싹과 잎, 뿌리도 캐 먹으며, 썩은 나무를 파서 벌레, 개미, 곤충의 번데기 등을 먹는다. 그 밖에 가재나 작은 물고기, 조류의 알이나 새끼도 잡아먹으며, 특히 꿀을 좋아한다. 겨울잠은 대체로 입동을 전후하여 굴 속에서 자기 시작하며, 다음해 3월에 잠에서 깨어나 활동을 시작한다. 반달가슴곰은 우리나라 전지역의 높은 산 지대에서 서식하였으나, 현재는 10∼20마리 정도만 남아 있는 것으로 추정하고 있다. 반달가슴곰은 우리나라에서 서식하는 가장 큰 동물로서 멸종위기에 처해있을 뿐만 아니라 국제적으로도 보호가 되고 있는 진귀한 동물이므로 천연기념물로 지정·보호하고 있다. The Asiatic Black Bear is found in East Siberia, China, Cambodia, Thailand, Himalayas, Taiwan, Japan, Baekdusan Mountain, Seoraksan Mountain, and Jirisan Mountain in Korea. It is 1.92m long, with its tail 80cm long. It weighs about 107kg and its fur is lustrous black. The animal has a half moon-like white figure on the front chest. The nose is pointed and short, its forehead is broad, and its ears are rather big. 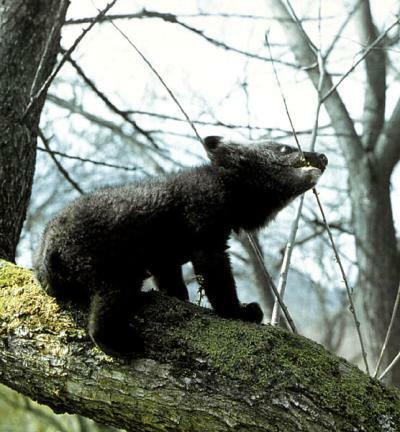 An Asiatic Black Bear is omnivorous, eating wild grapes, wild berries, acorns, etc. It eats buds, leaves, and roots in spring and its natural diet includes insects, ants, pupas, crayfish, small fish, and birds’ eggs or chicks. The Asiatic Black Bears hibernate in caves from November until March and they live in the high mountain across all of Korea. 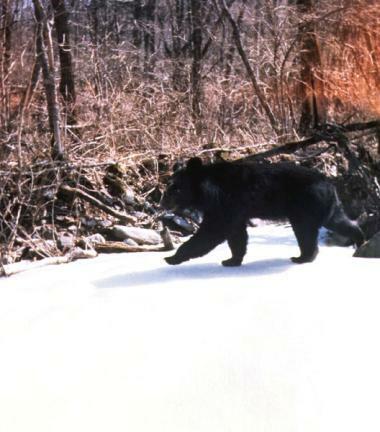 According to records, it is presumed that there are 10-20 bears in Korea. 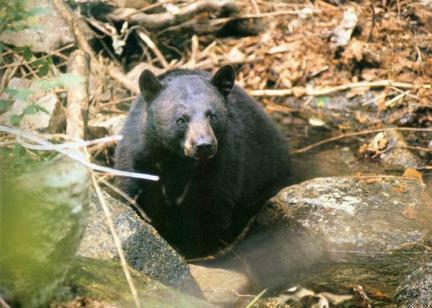 Since the Asiatic Black Bear is in danger of extinction, it is designated and protected as a Natural Monument.